Dr. Allison Fish is an interdisciplinary scholar whose research lies at the intersections of law, socio-cultural anthropology, and science and technology studies. She has completed higher degree studies in law (JD), public administration (MPA), and anthropology (PhD). Prior to joining UQ Dr. Fish was an assistant professor in the School of Informatics & Computing at Indiana University. The three questions that have directed much of her recent work are: What are the legal forms, technological infrastructures, and cultural logics that shape information/knowledge management practices? How do law and technology function together to mediate access? And How is accessibility increasingly framed as a fundamental human right and critical pathway to social enfranchisement? 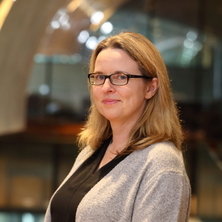 To date, the bulk of her research has addressed the application of intellectual property law to the regulation of various domains including; international markets for South Asian classical health systems, the development of digital archives and databases designed to function as defensive publications against future patents, the impact of open access on scholarly communication practices, and licensing and attribution practices in open source software communities. Recently, she has initiated two other research projects that examine other aspects of the law-and-technology interface. Additionally, she has extensive experience working with Native American communities and with health information technologies. George, Sheba M., Hayes, Erin Moran, Fish, Allison, Daskovich, Lauren Patty and Ogunyemi, Omolola I. (2016). Understanding the knowledge gap experienced by U.S. safety net patients in teleretinal screening. In: AMIA 2016 Annual Symposium, Chicago, IL, (590-599). 12-16 Nov 2016. Since 2001 there has been an increasing concern with national security in many countries throughout the world, including both Australia and the United States. This concern has led to significant legal changes supporting an intensified monitoring of both land and sea borders in an attempt to ensure that the legitimate international flows of goods and people take place at geographically constrained border ports-of-entry. In this sense, the border port-of-entry has become an increasingly narrow choke-point through which commodities and people must pass if they are to move between nation-states. During this same time period, however, the actual means of surveillance at border ports-of-entry has undergone a rapid transformation; expanding from face-to-face and paper-based mediums to include a complex assemblage of new and old technologies (e.g., x-rays, mirrors, biometric scans, chemical trace screenings, and internet-based tracking platforms). The purpose of this expansion is to eventually create no-stop border ports-of-entry that seamlessly identifies, tracks, and ensures only legitimate commodities and people enter into the nation-state at these points. In international commerce, accelerated passage through border ports is highly desirable as a cost saving mechanism that is of particular benefit for perishable commodities subject to spoilage (e.g., agricultural products, seafood, etc.). This project employs a comparative ethnographic approach aimed at elucidating how this tension, between national security and market interests, is navigated in the design and adoption of the new technologies that are being selected and tested at three specific ports-of-entry (Long Beach, Ambos Nogales, and Brisbane). A comparative ethnographic project of these sites will enhance understanding regarding how two nation-states, similarly situated in terms of socioeconomic and political standing, are using law and technology to strike a balance vis-a-vis competing interests. This project explores recent developments surrounding a key legal mechanism impacting access to and circulation of valuable knowledge – namely, intellectual and cultural property rights (IPRs). The project addresses the use of IPRs in the globalization and commodification of South Asian traditional health/spiritual systems conjoined in yoga and the ramifications this has for local and international markets, as well as global perceptions for South Asia as a site of creativity and innovation. The project also looks at the role that digital technologies play in protecting traditional knowledge and the impact that this defensive publication and anti-patenting strategy has on local and cultural practices. A key part of the project is a critical discussion of the way that people think about how law and technology interact with one another and how law changes over time to accommodate new objects and shifting attitudes. Specifically, this work challenges the commonly held idea that techno-scientific innovations constantly outpace legal change. I argue that this deterministic account is flawed and problematically frames law as merely a reflective and reactive mechanism that is constantly struggling behind in the wake of socio-technical change. The project is based on ethnographic fieldwork that took place over 24 months in India, California, Hong Kong, and Switzerland. This project explores the impact of computational technologies on the practice of law and the legal profession in the United States and Australia. Compared to other fields, such as finance, the legal profession is a relatively late adopter of new technologies, however, this is beginning to rapidly change. This project focuses on understanding the larger socio-technical environment that legal actors are facing and does so by taking a holistic approach that investigates how computational systems, composed of numerous technologies, are arranged and coordinated, as well as which tools become embedded into everyday legal work. The project is based on the idea that incorporating new technologies into social settings, including legal work spaces, is not a seamless or straightforward process and often requires significant changes and these changes must be understood in context. Fish, Allison (2016). Ethnographic explorations of intellectual property claims to yoga: a series of unexpected events. In Sheena Nahm and Cortney Hughes Rinker (Ed. ), Unexpected anthropology: new spaces, places, and methods for applied anthropology (pp. 136-150) New York: Routledge. Heien, E. M., Hwang, L., Fish, A., Smith, M., Dumit, J. and Kellogg, L. (2014). Cultural and technological issues and solutions for geodynamics software citation. In: American Geosciences Union Fall Meeting Abstracts. American Geosciences Union Fall Meeting, United States, (). Dec 2014. Ogunyemi, Omolola, Terrien, Elizabeth, Eccles, Alicia, Patty, Lauren, George, Sheba, Fish, Allison, Tekleheimanot, Senait, Ilapakurthi, Ramarao, Aimiuwu, Otaren and Baker, Richard (2011). Teleretinal screening for diabetic retinopathy in six Los Angeles urban safety-net clinics: initial findings. In: AMIA Annual Sumposium Proceedings 2011. Conference Proceedings for the American Medical Informatics Association, Washington, DC, United States, (1027-1035). 22 - 26 October 2011. Fish, Allison, George, Sheba, Terrein, Elizabeth, Eccles, Alicia, Baker, Richard and Ogunyemi, Omolola (2011). Workflow concerns and workarounds of readers in an urban safety net teleretinal screening study. In: AMIA Annual Symposium Proceedings 2011. Conference Proceedings for the Annual Meeting of the American Medical Informatics Association, Washington, DC, United States, (417-426). 22 - 26 October 2011.